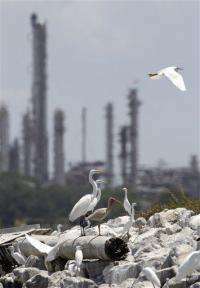 (AP) -- Brown pelicans, long-necked egrets, flamingo-like roseate spoonbills and squawking seagulls fly lazily around a Texas Gulf Coast island. Nearby, a toddler-aged wetland seeded with marsh grass completes the ecosystem, its thousands of inhabitants unaware their home is a manmade creation dredged from the Houston Ship Channel. It's all part of a 20-year-old project to restore lost wetlands and islands off the Texas coast. The federal government is hoping it could become a model for rebuilding these crucial ecosystems elsewhere in the five-state Gulf region. This and other efforts to revitalize the environment and economy of the long-neglected coastal area are being partially bankrolled by a $1 billion fund from BP, which agreed to pay the money as part of its responsibility for the massive oil spill that fouled the Gulf of Mexico. Harris Sherman, undersecretary for natural resources and the environment at the U.S. Department of Agriculture, recently viewed a bird island and toured a "demo" wetland used to experiment how to best grow thick marsh grasses. "Strengthening the ecology of the Gulf area is critically important. In doing so we can improve the economy of the Gulf region and strengthen the resiliency of the communities of the Gulf," Sherman said. Sherman represents the USDA on the Gulf Coast Ecosystem Restoration Task Force, a group created by President Barack Obama following last summer's spill of millions of gallons of oil into the Gulf. The disaster highlighted not only the dangers of deep-water drilling but also the damage that has been done to the sensitive Gulf ecosystem through decades of careless indifference. After Hurricane Katrina in 2005 it became clear that the significant decrease in wetland areas has endangered wildlife that rely on them for food and habitat. It also has damaged an economy reliant on fishing, tourism and other water-based industries and left coastal communities vulnerable to storms that are no longer slowed down by barrier islands. BP was the majority owner of the well when it blew up on April 20, 2010, causing the spill. It agreed to put $1 billion toward a long-term effort to improve the environment. The federal task force includes representatives from all five states that border the Gulf, and is helping distribute the money. Each state will get $100 million. The Department of Interior and the Department of Commerce will each get another $100 million, and the remaining $300 million will be distributed to other projects. The task force has to present Obama with a report and a long-term strategy for restoring the ecosystem in July. The task force has already said one of the greatest challenges and top priorities for guaranteeing a healthy environment is ensuring sediment from upland waters, such as the Mississippi River, renew their natural flow to replenish wetlands and barrier islands in the Gulf. The Houston Ship Channel was created in 1917, and the sediment dredged from the bottom was dumped onshore to create the waterway that allows marine traffic into inland area. From then through the 1980s, more than 35,000 acres of wetlands were lost in Texas' Galveston Bay area alone, said Scott Alford, a soil conservationist for the Natural Resources Conservation Service. In 1992, NRCS began working with the Port of Houston to reuse the soil continuously dredged from the channel - sometimes to expand and widen it, other times to simply keep it deep enough so large tankers could navigate the refinery-lined area. Scientists were initially unsure they would be able to grow sensitive marsh grass in dredged soil. First, they created levees to ensure the soil did not disperse into the bay. Slowly, they removed the excess water and transported the dirt through a pipeline to a designated area. Surrounding it with rocks to prevent erosion, scientists worked tirelessly to figure out how thick and deep the soil needed to be not only to allow the grass to grow but to prevent it from sinking. They also needed to make sure there were creeks and ponds in the marsh, to ensure water could circulate. Within two years, that first wetland area was covered in the tall grass that provides homes and food to mammals, reptiles, birds and a variety of marine life. In fact, about 95 percent of the Gulf of Mexico's wildlife rely on marshland for survival at some point. "If you've lost marshes, you've lost everything that lives in the bay and the Gulf," Alford said. The goal over 50 years is to create more than 4,200 acres of intertidal marsh, 6 acres of bird island and hundreds of acres of oyster reef. Already, they have created more than 1,800 acres of marshland, a bird island and more than 170 acres of oyster reef, Alford said. The project, the biggest of its kind in the nation, is now being done on a smaller scale in other states, including nearby Louisiana, whose wetlands have suffered similar damage. Now Alford is hopeful his project will not only serve as a model for what can be done, but that the oil spill fund will help the Gulf states who share similar ecosystems and problems to work together to guarantee the survival and viability of the ecosystem. Sherman believes restoring the environment, at least in part, to its original state is critical to the region's economy and the sustainability of its communities. "It is impressive, very impressive," he says, squinting into the sun at the screaming birds flying over their manmade home, the steam from the refineries making puffy white cloud-like formations in the sky. Really, he said, it is a win-win situation. The channel continues to be navigable and prosperous, while the environment is strengthened. "We hope to create similar examples elsewhere," Sherman said.